Here’s a recipe for this delicious soup. 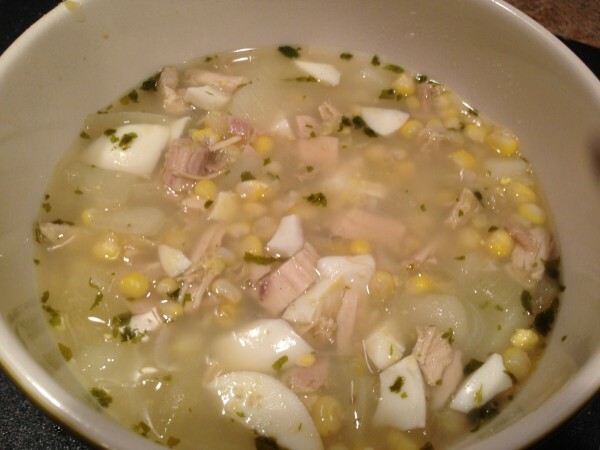 One thing…this is a recipe for the York County version of the soup. The Lancaster County version of the soup contains something called “rivels”, which basically are little dumplings. If you want to add that, you can find a recipe for them online. - Take chicken and put into large pot of water. - Dice and add onion to pot. - Add parsley, salt, and pepper. - Bring to boil and set to simmer, until chicken is done and falls off the bone (about 1 hour). - Hard-boil eggs, set aside to cool. - Bring soup back up to boil and reduce heat to simmer. - Pick chicken from bones, dice, and add to pot. - Peel potatoes, dice, and add to pot. - Peel eggs, and dice, add to pot (including yokes, as they will practically dissolve and add a nice flavor). - Simmer soup until potatoes are soft, about 20-25 minutes. - Serve hot with crackers. This soup is a meal unto itself but can be served with a favorite sandwich.